Friends, out Lenten lesson this morning is the Grace of God. The Grace of God. 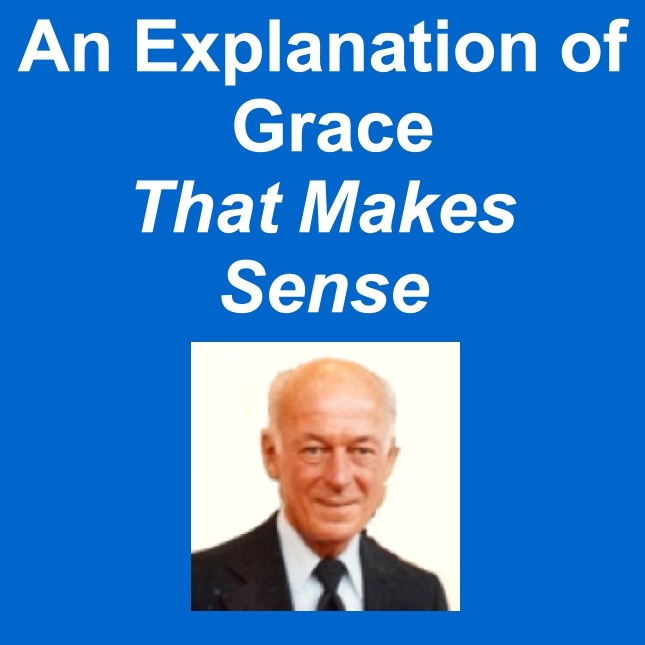 The Grace of God is a term that is used very seldom in the Old Testament and which is hardly used at all in the Gospels but is used a great deal in the books of the New Testament beginning with the Book of Acts. This has a meaning for us. It tells us that the Grace of God is something which one experiences after he has come into the Jesus Christ Way of life. Very few people experience the Grace of God before, or if they have not come into the Jesus Christ Way, because the Jesus Christ Way was concerned almost entirely with demonstrating and sharing this wonderful experience, called in the Bible, the Grace of God. The purpose of our lesson this morning Will be to explain what the grace of God is and how it can be experienced by any person who is willing to go through the acceptance of it. But before we talk about it we want to talk about the law, first. Because the Grace of God is a part of this great something called the law. I will go back to the Old Testament first. In the Old Testament the law is called Jehovah or the Lord. Jehovah and the Lord refer to the same thing. They refer to a phase of this something called the law. But when the Lord or Jehovah is used as the symbol for the law it refers to a certain phase of the law called cause and effect. Cause and effect is not the whole law, folks. It is just part of the law. A phase of the law. It is not the whole law. Now what is the law? Well, if I were to really explain what the law is I would be up here all week. But I will try and make it as brief and simple as possible. Every person, every person is the Spirit of God made manifest and conscious of self. And within every person are all of the qualities of God. We are one with our Father-Mother-God in reality and in spirit. However, we are also in what is called the human consciousness and this phase of us which we call me, Ed Rabel, or you, whatever your name is at present, this is your unfolding human consciousness. Now this phase of us goes through many experiences. Makes many trials and errors. Has many ups and downs, many ins and outs. All of these various experiences in what we call life are gone through by this phase of us, the human consciousness. Now, to help this human consciousness of us unfold and grow into a sure and permanent realization of truth there has been created for our benefit a great law. And this law is an activity which always, always, always works in us, through us, and for us, for our highest good. This law is the law of our highest good. It is always in operation. It is always working. It never fails. However, in one phase of our development or unfoldment, this law, which is for our highest good, takes a certain form of activity which in the Old Testament is called, the Lord or Jehovah. And it is the law of cause and effect and it is this phase of law which most people are familiar with and under which most people are living, at the present moment. And this is how that phase of the law works. Every thought, every feeling, every word, that we accept in our conscious phase of mind goes into what we call consciousness. And the type of thoughts, the type of words, and the type of feelings that we except determine the character or the state of our consciousness. The state of consciousness we are in at any moment determines the character of the condition that we meet in life, in mind, in body, and in the affairs. In other words, according to the way we think, according to the way we feel, and according to the way we speak, do we encounter the conditions in mind, body, and affairs. This is one of the basic fundamental truths of metaphysics. This is called cause and effect. Under this law if one wants to change conditions in his life he must change his thoughts and feelings and words. If one’s thoughts, feelings, and words improve then ones condition in mind, body, and affairs improve. If one’s thoughts, words, and actions and feelings are negative and destructive then one’s conditions in life deteriorate. Become painful and difficult. It is an old, old story almost any intelligent person knows this and as a result most alert and intelligent people try to cooperate with this law. That is they watch their thought, they control their feelings, they weight their words before they speak, they get themselves into a harmonious and positive way of thinking, feeling, and speaking. And as a result they have a very wonderful blessings in their lives. In fact, one type of prayer is based upon this entirely. That is, if my prayer is positive, affirmative, and degrees with the letter of the law then I will get good results in my prayer. Under this phase of the law, folks, one’s prayers are answered according to one’s state of consciousness. Now that is the point that I have been leading up to. Under the Old Testament, law of cause and effect, the answer one gets to his prayers depends entirely upon his present state of consciousness. Is this the whole story? Is this always the way it’s got to be? Are my prayers always going to be answered according to my present state of consciousness? What do you think? No. There is something greater than this. This something which is greater is called the Grace of God which comes to a person as an experience after he follows the Jesus Christ Way of living. Not before that. Before that he can be ever so good. He can’t be ever so pious. He can be the most honest and decent and clean living person in the world, but if he has not really followed the Jesus Christ Way, he is still functioning under the law of cause and effects, which is good. It is good, there is nothing wrong with it, but it is limited. It says, your prayers shall be answered but they shall be answered according to your present state of consciousness. If your present state of consciousness is negative and upset then you are going to meet negative and upset conditions and your prayers will be delayed in their answer. If you are in an uplifted, positive state of consciousness for good for you you are going to meet blessings and your prayers will be answered to quickly and satisfactorily. But it all depends upon your state of consciousness. That is quite a responsibility, folks. I hate to think that my prayers are always going to have to be answered according to Ed Rabel’s present state of consciousness. And that is one of the reasons why I have chosen the Jesus Christ way, because through the Jesus Christ Way of living one enters into a new dimension of the law. A new aspect of it which was not known before and which is greater than the old phase called cause and effect. And here we come into the Grace of God. The Grace of God is this: God loves me. God understands me. Regardless of my present state of consciousness. There it is, folks. That is the Grace of God. God loves me. God understands me and God will answer my prayers in his perfect way. Regardless of my present state of consciousness. In other words, the answer to my prayer no longer depends entirely upon my state of consciousness. It now depends upon God’s love for me. God’s understanding of me. God’s forgiveness towards me. His Will of absolute good. Not just what is my state of consciousness but God and God only. Now folks, when this occurs then a great transformation takes place in a person’s prayer activity and the results which one encounters in his daily living. Now right here one of you may be questioning in this manner. You say does this mean if I decide that I want to except the Grace of God that I need no longer think about cause and effect? That I then don’t have any worries at all about consciousness? I don’t have to watch my words or keep my thoughts positive and constructive, that I can let my state of consciousness do anything that it wants? I won’t have to care about that anymore because I am under God’s grace? No, it does not mean that, folks. It means that the law of cause and effects still is in operation. We still have to keep our state of consciousness constructive and harmonious, but it simply means that we no longer have to depend upon that state of consciousness for the answer to prayer. Because when we are depending upon the state of consciousness then we get to what are called specific results. But when we are depending entirely upon God’s Grace, the answer to every prayer is something far greater than our present state of consciousness could have conceived. Now in the New Testament we get the first glimpse of somebody putting herself completely in the Grace of God, rather than cause and effect, in the example of Mary, the mother of Jesus. She is the first character in the Bible to demonstrate the act of placing oneself consciously under the Grace of God, where she is told that she is going to conceive and all of the details of the birth of her child and her immediately response to this is—“Behold the handmaiden of the Lord. Be at done onto me according to thy word.” Here is a woman putting herself entirely under God’s love and understanding. Not thinking about, well, am I ready for this? Am I in the right to state of consciousness? Have I been a good girl enough for this? None of that. No arguing, no questioning, but a complete turning over of her life to God. “Be at done onto me according to thy word.” Look at what the answer was. The greatest thing that ever happened to any woman on this planet, the birth of a son, Jesus Christ. Now, folks, in the teachings of Jesus he gives us a very beautiful parable or allegory, if you prefer, in which he compares the law of cause and effect and the Grace of God. And the result of being in these two states of consciousness and he leaves us free to take our choice, which one shall we choose. And I will read the parable to you and then we will go over it briefly it’s meaning. This is found in Matthew, chapter 20, beginning with the first verse. It begins by saying, “For the kingdom of heaven is like onto a man.” But for purposes of this lesson lettuce change it and say, the Grace of God, because this is what he is talking about. A magnificent parable if it is understood. Jesus is here, of course, speaking in the language of universal symbology as he always did. Did you know that folks? This is a very important thing to understand the teachings of Jesus correctly. Jesus, when he is talking about people and them doing things, he is doing the same thing that the Old Testament writers did, only he is speaking it. He is not talking about human beings, people, individuals; he is talking about thoughts and feelings within every person’s consciousness. When his parables are interpreted that way they reveal their true meaning. Let’s see what he is telling us here. First of all, the householder, or the Lord of the Vineyard represents, of course, the law. The law of our highest good. The law of our being. Jehovah of the Old Testament. God indwelling Christ in the New Testament. The Vineyard is our consciousness and the life we are living, they are one. Our consciousness and our life. Now the laborers in the Vineyard represent our thoughts, our feelings, our words, and our prayers, which we go to work in consciousness to produce the fruit of the Vineyard. The fruits of consciousness. The wages paid to the laborers represent the results that we get according to our thoughts, feelings, and prayers, and words. Words and prayers could be synonymous. In another words the wages paid to the laborers represented the answers to our prayers. Now the first group of labors go to work after making an agreement for a penny. They were depending upon their agreement rather than their Lord’s judgment as to what what was right. Or what he willed to give them. They did not trust at that. Instead, they trusted their agreement which was for a penny. They labored all day and they got exactly what they had agreed to. There was no cheating, there was no turning away from the agreement, it was paid. But they were not satisfied. This represents, folks, these thoughts and feelings and these prayers which we utter or except which are depending upon the law of cause and effect. In other words, praying for something specific because this is what I think I want. I want a red to Cadillac. Alright, I have been told that if I pray, if I affirm, if I believe, I can get to what I want. So I make an agreement with my lord for that red Cadillac, the penny, and I work, I affirm, I mentally affirm, I keep my vision on that red Cadillac, and I work, work, work, I’ll get it. But it won’t to satisfy me. It won’t. It can’t. Because it is a thing and things never truly satisfy. I can even get a healing that way. I have a toothache, I want that tooth healed. Alright, so I agree how that is going to be done. I shall go to a dentist and have it pulled. Alright, that is my agreement and so I do that. I pray, I affirm, everything is right, I go to the dentist and I get it pulled. Perfect answer, that was the agreement, that was the answer. There is nothing wrong with this, folks, nothing wrong at all. This will work but it is a limited way of praying. And probably, if you will pardon my saying so, the most common way this is used is, I want a husband. You can get the husband, anybody can get a husband if she wants one badly enough. But if that is all that she wants, that is all that she is going to get. And that doesn’t satisfy her. Well, we all know what this is. This is when we go into a prayer under an agreement. Trusting the law of cause and effect, I wanted, I affirm it, I keep the picture in my mind, yes, I will get the form that I have a great two. But it won’t satisfy me. This is the bread which does not satisfy. And the water that one drinks then thirsts again. Jesus talked about it many times. But now we have something else shown us in the story. Here we have a group of laborers who do not bind their selves to an agreement. We go into the vineyard to work, trusting 100% to the will of the Lord of the Vineyard. They don’t make any agreement. They don’t have any outlines in their head. They’re not telling that Lord what he must pay them because of the work that they are doing. They go into work and to trust the will of the Lord of the Vineyard. And as a result they get far more than they deserved and much more then they personally expected. This is a perfect description of one who prays in this manner: praying under the Grace of God rather than according to the law of cause and effect. In this case, one who would pray, would go into his inner chamber and turn everything over to his God. Not only the need that he may be praying about but he will also turn his present state of consciousness over to God. He will turn his doubts, his fears, his belief over to God. In other words, lock, stock, and barrel over to God. God will answer my prayer in his perfect way because he loves me, because he understands me, and if this is true regardless of the state of consciousness I may be in at this moment. I am not depending upon my state of consciousness, the agreement, I am depending on God, and God only. When a person does this he is under the Grace of God and his answer will be something far greater than he thinks he deserves, and far greater than his present state of consciousness would have admitted possible. Now folks, the lesson to be learned here is this: The next time we have to pray about something, a healing, a prosperity need, some adjustment in our human relationships, anything at all that we have to pray about. And if we catch ourselves being concerned about, well, what is my consciousness at this time, have I enough faith, have my thoughts been positive enough, have I been a good enough boy that God will listen. I am getting tense and anxious about my state of consciousness before I pray. Don’t do it. Drop that. Don’t concern yourself with that. Go straight into the prayer with this thought, I may be in a slightly negative state of consciousness. I may have been worrying too much. I may be a little tense and anxious. I may have a little unbelief clinging to me. That may be my present state of consciousness. But I am not turning to my state of consciousness to determine the answer to my prayers. I take my whole self, my need and my state of consciousness and give it all to God, completely. I trust His will for me 100%. It doesn’t matter what I deserve, it doesn’t matter how long I have been working for this thing., the only thing that matters is—God loves me, God understands me, and God is now fulfilling my need in His perfect way. The result can only be one thing, folks. An answer that will satisfy you and draw you closer to God than you have ever been in your whole life. And this process will never stop. This will be your experience with each prayer from then on. Turning of yourself completely into God’s Grace. His love for you, His understanding for you, which brings forth His perfect answer. And now folks, let us give a prayer of thanksgiving for this greater dimension of the law. This dimension which transcends cause and effect. This activity of the law which does not depend entirely on our state of consciousness but depends upon God’s never failing love and understanding, which is called His Grace. I place myself and all that concerns me under the Grace of God. Together, I place myself and all that concerns me under the Grace of God. And Father-Mother-God Thy Grace is sufficient un to us. In the name and through the power of Jesus Christ. Amen.